Greetings from Goshen, Ky., where Payday Senior Labor Reporter has isolated himself on a chicken farm to get away from the madness of the Kentucky Derby. This week, activists across the South are excited about the victory of Chokwe Antar Lumumba in the Democratic primary for the Jackson, Miss., mayoral election. (Because of the city’s Democratic voting base, he is almost certain to win the general election next month.) He garnered 55 percent of the vote, easily defeating the nine other candidates in the race, which included incumbent Jackson Mayor Tony Yarber. Lumumba ran on a radical platform that called for revising the trend of privatization and enacting the People’s Platform, which Lumumba says centers human rights and economic empowerment. Among many radical proposals, he called for the People’s Assembly, where communities would gather to discuss their needs and shared goals. Lumumba has also said that he intends to assist the UAW in their efforts to unionize Nissan in nearby Canton, Miss. This week, as part of its omnibus spending bill, congressional lawmakers said they had a reached a “permanent” solution to the underfunded United Mine Workers of America health care fund. The $1.3 billion deal, to be paid for through import duties, would fund health care benefits for 22,500 retirees for up to 10 years, according to the CBO. However, the spending bill does not fix the problem created by pension shortfalls that could affect 89,000 pensioners. The request for proposal says that “no current qualified and productive facilities management employees will be unemployed” as a result of outsourcing. That seemingly subjective standard gets applied through background checks, skills verifications, and drug testing, something not currently asked of state workers. Other potential loopholes distinguish between “regular” and “non-regular” employees, and allow JLL to transfer workers up to 50 miles away from their existing employment locations. “What we anticipate is for there to be reduction in state payroll,” said Melanie Barron of UCW. In addition, Barron said, attrition since the outsourcing process began two years ago has already led to lower staffing levels, which are being used as a baseline for the new employer. “They’ll intentionally understaff,” she said. As part of a tentative budget proposal by Washington Metropolitan Area Transit Authority General Manager Paul J. Wiedefield has proposed to privatize parts of the D.C public transportation system, limit employee wages and benefits, and outsource work. The Amalgamated Transit Union, which represents over 9,000 workers on D.C. Metro, has protested the move. “To the extent that privatization can claim any savings, it is by driving workers into poverty and intentionally creating a turnover rate that keeps workers at the bottom of the wage scale forever,” ATU President Larry Hanley told the Washington Post. A new proposal by the University of the North Carolina Board of Governors would bar law school centers from representing public-interest cases, which puts into jeopardy the ability of law school institutions and student to participate in legal work in the state. The proposal has many at the university up in arms, including the UNC-Chapel Hill Law School Dean Martin Brinkley. The idea of free college tuition is one that is increasingly gaining traction across America. Now, a new front may have been open in the battle for free tuition. This week, the student government at Western Kentucky University voted to grant free tuition to all African-American students as part of repartitions for the rule that enslaved African Americans played in constructing the university. However, the measure would have to be approved by the university’s administration before it could be implemented, and the school’s president has already condemned it. Under federal law, publicly traded companies are required to hold stockholder meetings once a year. Often activists buy stocks in an attempt to gain access to speak from the floor of these meetings. Now, in a new move designed to prevent such protests, Duke Energy has decided to hold online virtual town halls. The Council of Institutional Investors has protested the decision, saying that it limits shareholder involvement in shaping policy. Research was not a top-down process in SNCC. Rather, organizers and researchers worked closely with each other as a larger, collective unit. Organizers shaped and did research, and researchers informed and participated in organizing. Everyone was in constant interaction with each other. 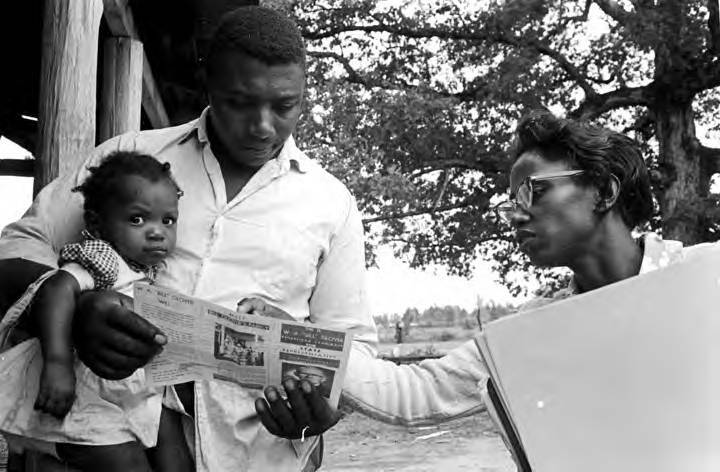 A few examples illustrate this interplay between research and organizing, as well as the range of important ways that research helped aid SNCC’s work. 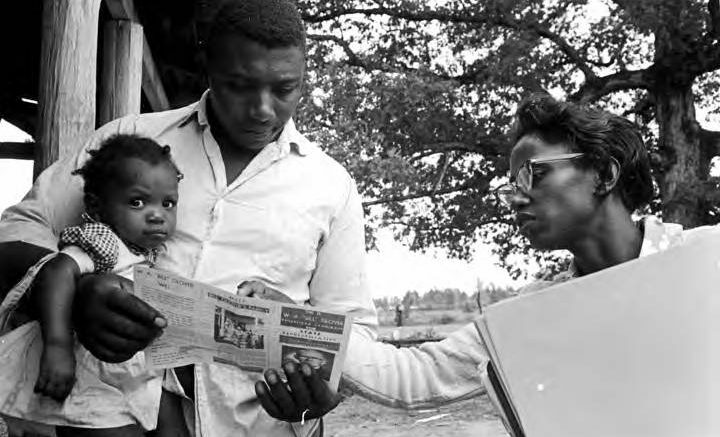 As organizers sought to expand the movement, researchers provided information to field staff to help their campaigns. For example, they put together a pamphlet, “The Mississippi Power Structure,” that analyzed how big money — from cotton farms, northern capital, oil companies, electric power, and finance capital — was invested in the state and how it related to political power and class and racial hierarchies. The document also illustrated how white elites pitted poor whites against poor blacks in Mississippi so they could more easily exploit both groups. Among other things, the pamphlet analyzed corporate power’s connection to the state’s white supremacist political rule. The pamphlet showed, for example, how Mississippi’s biggest electric company and two biggest banks had overlapping leaders who were also leaders of the White Citizens’ Council that dominated the Democratic Party, the state’s ruling party. SNCC named names and mapped out the ties between these different entities to reveal the flow and interlocks of corporate, racist, and political power in the state. — A new, emotional video shows Volkswagen workers describing injuries that they have sustained while working at the Chattanooga, Tenn., plant. Watch it here. In one of the book’s most eye-opening chapters, Hyra casts light on a pair of phenomena — “black branding” and “living the wire” — that reveal a lot about racial dynamics in early 21st century America. “Black branding” describes how developers and other mostly white business interests actively promoted Shaw’s historic black identity as a marketing strategy to attract white renters and buyers. Their success helped tip the neighborhood’s demographics from 70 percent black in 1970 to 30 percent in 2010. The advertising pitch represented a dramatic shift. — Finally, West Virginia Public Broadcasting, as part of a series named “Struggle to Stay,” has a profile of one young man’s attempts to keep living in the Coal River Valley region of West Virginia. Mike Elk is a member of the Washington-Baltimore NewsGuild and is the senior labor reporter at Payday Report. He previously served as senior labor reporter at POLITICO and has written for the New York Times. Be the first to comment on "UNC to Stop Public Interest Law Work – Tenn Signs Outsourcing Deal – Hidden History of SNCC’s Research Dept."